John McCarville Service Details - Whitby, Ontario | Barnes Memorial Funeral Home Ltd.
"Rest in Peace my love." 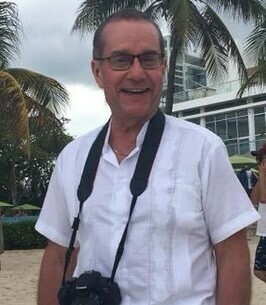 Passed away suddenly on Monday September 3rd, 2018 at the age of 59. Loved dad of Justin McCarville and Jordan McCarville both of Whitby. Survived by his mother Mary McCarville of Toronto and the late Cyril. Dear brother of Joseph McCarville and his wife Valerie of Markham, Desmond McCarville and his wife Bonnie Bonita Heath of Toronto and Kathleen Harding of Cobourg. Lou will be fondly remembered by several nieces and nephews and their families. Visitation at Barnes Memorial Funeral Home, 5295 Thickson Rd. N. Whitby on Saturday September 8th from 11:00 a.m. until time of celebration of life service in the Barnes Chapel Saturday afternoon at 1:00 p.m. In memory of Lou, memorial donations to the Heart and Stroke Foundation in lieu of flowers would be appreciated by the family. I was very saddend to hear of Lou's passing. I had found memories of Lou in his younger years. Sincere condolence to the McCarville family. So sorry to hear about Lou. Our condolences to all the family. In memory of Lou. He will be greatly missed. I am so sorry to learn that Lou has passed away. He will be dearly missed. I hope a passage at John 5:28,29 brings comfort to all who are mourning. May we all look forward to seeing our loved ones again alive and healthy. Your family will be in my prayers. We will truly miss his contagious laugh. We are so saddened to hear of Lou's passing. He was a dear colleague and friend, and will be greatly missed. Our deepest sympathies to the McCarville family.